How secure is your network? Would you know if hackers gained access to it? You’ve got antivirus software on your computers, but what if you could stop viruses before they got onto your network? Would you like to be able to detect if a virus gets into a computer and kills the local anti-virus? Local anti-virus cannot detect network intrusions, but ITXpert Network Security can! Wish you could monitor or limit access to certain websites? Want to offer public WiFi to your customers while limiting the types of content they can access? ITXpert Network Security can do all this and much more! Computers are a vital part of any business – but they can also pose a threat. Hackers and criminals are constantly probing networks for vulnerabilities so they can compromise them and the systems within. Critical files encrypted and held for ransom, bank accounts drained, compromised equipment used to attack other networks, sensitive information stolen, and more. Yet most small businesses use simple consumer grade routers designed for home use. They provide basic passive protection. They are popular because they are simple – buy it, connect it, do some basic configuration and that’s it. But they also have vulnerabilities. Have you ever updated the firmware on your router? Is there even new software available for it? Hackers took down the Playstation and XBox gaming networks using mostly compromised consumer routers. If they can get into your network, they can do a lot of damage. Couple that with the threat of employee devices like phones, personal laptops, and other devices you don’t control, and your network can turn into a dangerous insecure place. In today’s hostile networking environment, you need managed network security. You need a business class gateway firewall configured and managed by IT Xperts that keeps your business network safe, secure, and online. Simply running anti-virus software on your computers is not enough anymore. Most virus infections disable a computers anti-virus if they get in, meaning you’re vulnerable. Proper network protection requires an additional layer of anti-virus protection as well as constant monitoring of your network in the event a system is compromised or someone connects a compromised system to your network. Our gateways send realtime alerts to our IT Xperts as well as daily summaries of activity and performance. Do you worry about HIPAA or PCI compliance? Content filtering and network scanning can help! Our gateways protect your network with award winning Kaspersky Antivirus. Best of all there is no equipment to buy! You lease the equipment from us and we take care of everything. Configuration, monitoring, support, and more is included in the low monthly rate, depending on features and bandwidth requirements. Our pricing structure for My ITXpert Managed Security allows you to actively protect your network and business for less than $2/day! No equipment to buy! Need better WiFi coverage? We can install the latest in WiFi technology with 866mbps speeds and network partitioning so you can have secure WiFi for your devices and separate public WiFi for your customers. All with active content filtering, realtime network antivirus for all connected devices, and bandwidth management. 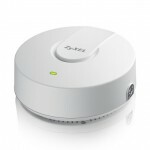 Best of all – it is unobtrusive and looks like a small smoke detector. All for $9/month each and no equipment to buy. for IT Xperts that protect your network!